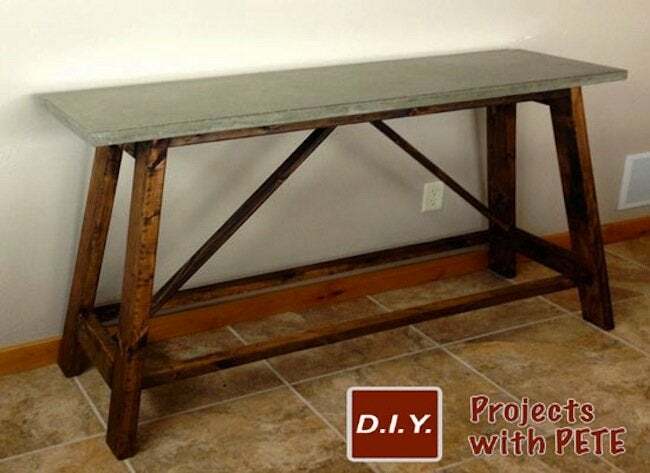 This DIY table comes together with a custom wood base and concrete top. Sometimes we see a project that truly bowls us over. 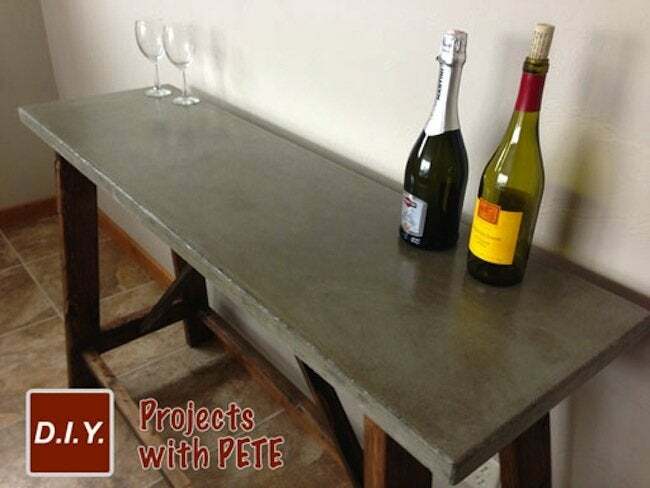 This concrete tabletop from Pete at D.I.Y. 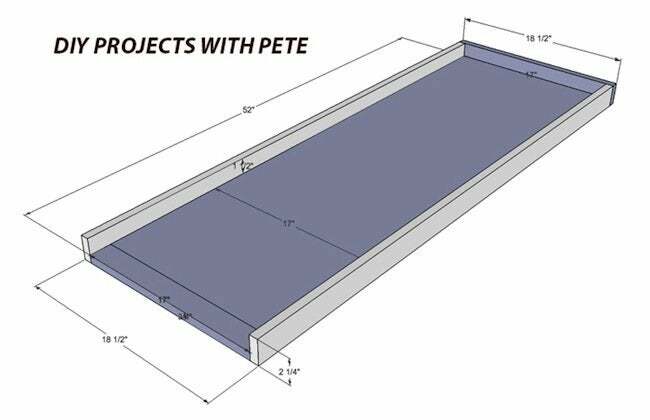 Projects with Pete is one of those projects. 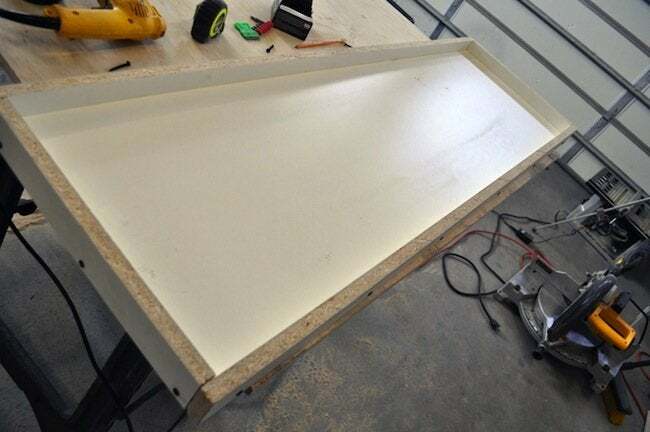 Using Ana White’s plans for his table base, Pete then topped his creation with a concrete top made with melamine board forms. We think the end result is as stunning as it is sturdy. Take a look at his tutorial for the details. Determine the size of table you’d like to make. The buffet table I made is 17″wide by 52″ long by 1.5″ thick. Here is a diagram showing how I made the mold. Cut the bottom of the mold out of melamine using a circular saw. This piece should be the exact width and length you’d like the concrete table to be. Cut the strips that will border the bottom piece. 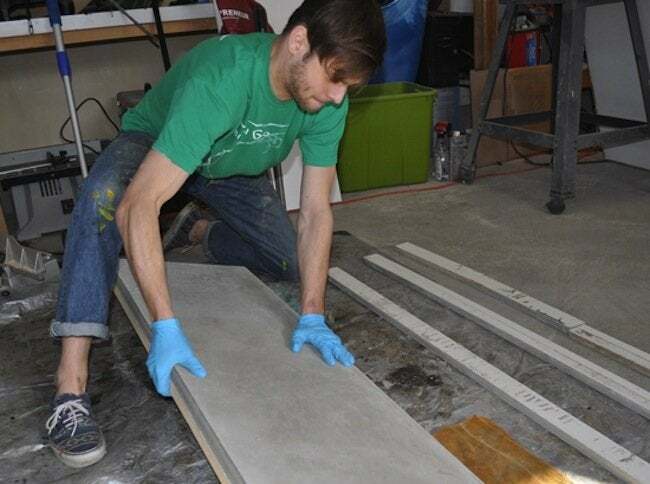 If you want a 1.5″ thick concrete slab, add 3/4″ to the strips so they are 2.25″ tall. This accommodates for the bottom of the mold. Assemble the sides of the mold. Attach using 1 5/8 inch black drywall screws about every 8-12 inches. Drill a pilot hole to help it go in easier. 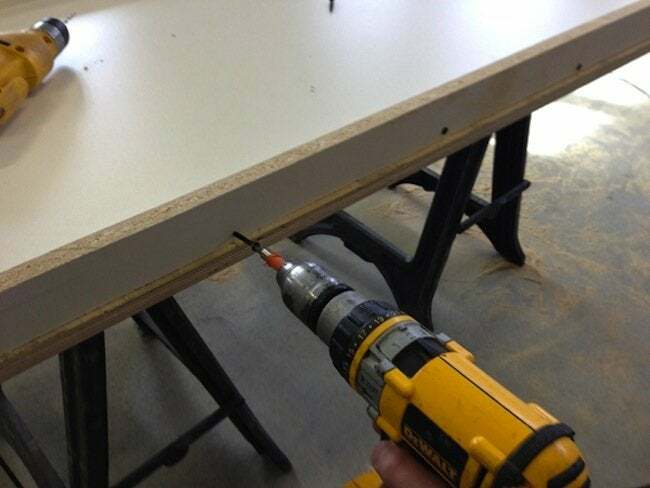 Make sure to drill in from the side as evenly as possible. Complete the mold. Once assembled, the mold will look like the photo below. You will now have a structure to pour in your concrete. Note: The actual top of your concrete table will be very smooth because it will cure against the smooth and flat melamine surfaces. The part that you screed and trowel later on will actually be the bottom side. You will flip the mold once the project has cured. Caulk the creases in your mold. In my video, I use a squeeze tube of 100% silicon caulk. You can also use a caulk gun. Then run a caulk tool to smooth it out. 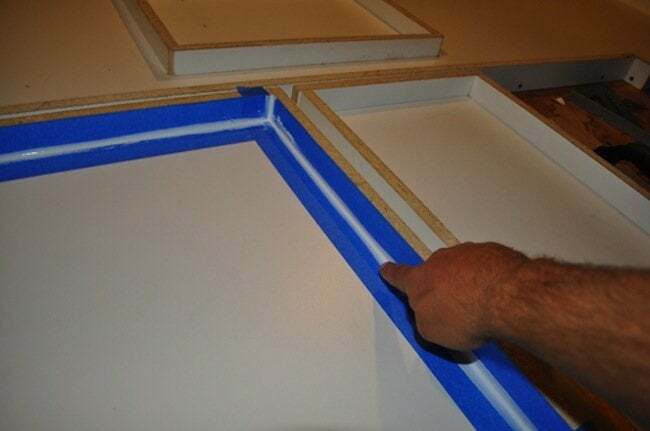 You can also use painter’s tape to get an even caulk line as pictured below. 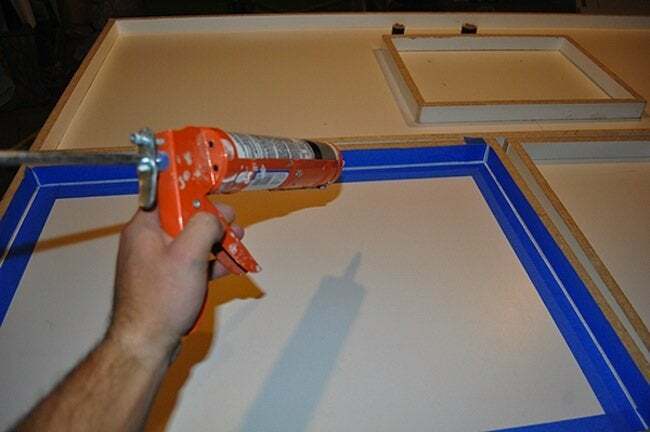 Once caulked, use your finger to smooth out the bead. Have paper towels around to clean off your hands when finished! As soon as you are finished, pull the tape off while the caulk is still wet. Use a paper towel to remove any caulk that accidentally gets on other parts of the mold. Let cure for a few hours. Cut re-enforcement. Once the caulk has cured, go ahead and cut the re-enforcement to size using a bolt cutter. If your table is 52″ long by 17″ in width, cut the metal wiring to about 50″ by 15″. It will leave about an inch of play on each side. Then use rubbing alcohol and a paper towel to thoroughly clean the mold, making sure all sawdust and particles are out of the mold. 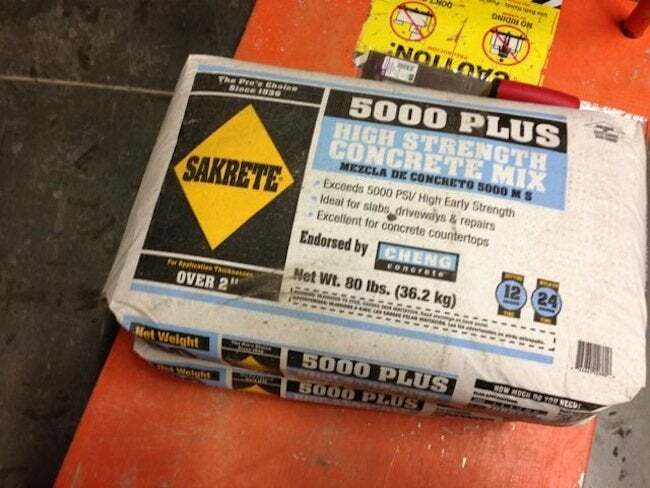 It’s time to mix up the concrete. Follow the directions on the bag to see how much water they recommend adding. 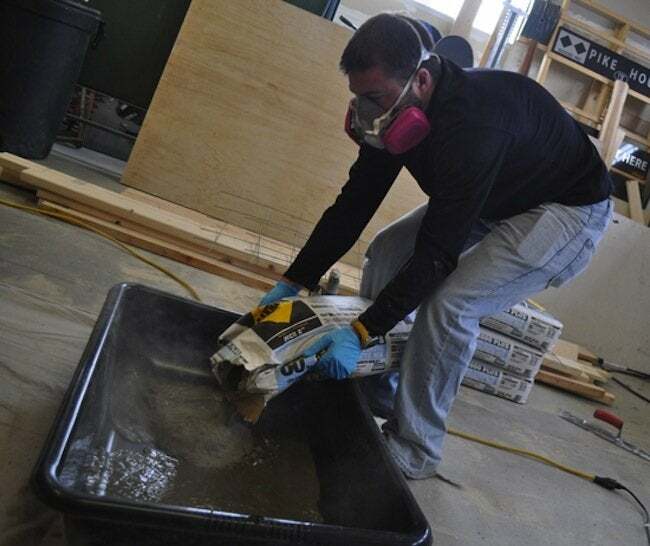 I like to pour some water into the tub prior to the concrete to minimize dust. Wear a dust mask for this process because the particles are not good to breathe. Mix 1 or 2 bags of concrete at a time. To stir up the concrete use a small shovel or garden hoe. I like to mix it to a peanut butter consistency. If it is too dry add a little more water at a time. If too much is added, put in a little more concrete mix. *Now is the time to add liquid or powder coloring to the mix if you’d like. Another way to add color is by using concrete acid stain after the project has cured. 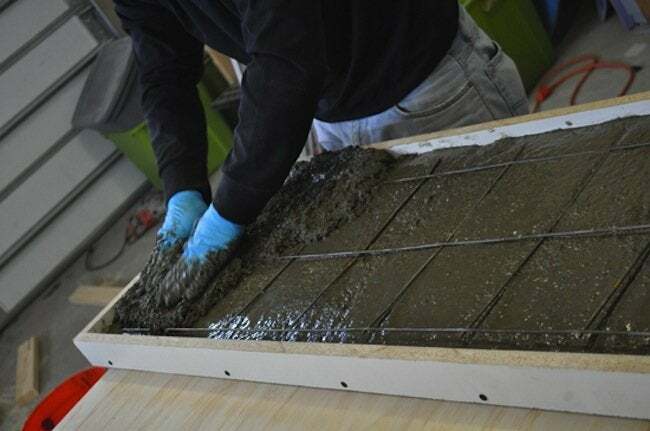 Take a handful of concrete (wearing your rubber gloves of course), and start packing the concrete into the mold. 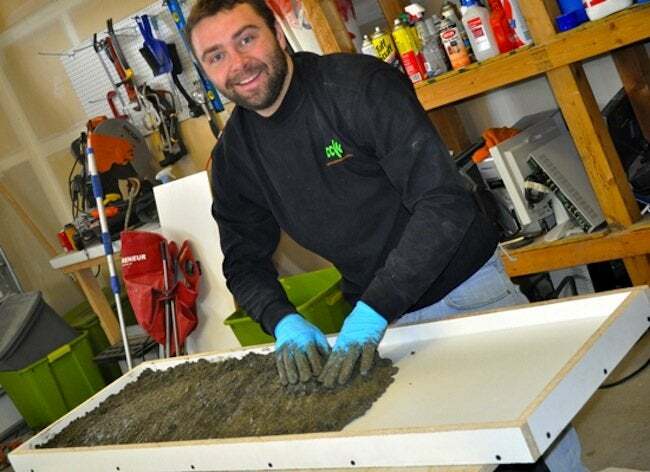 *Don’t forget to make sure your work table is as level as possible prior to packing the concrete. Once the mold is filled up a little more than half way you’ll want to add the re-enforcement. Simply put the re-enforcement in place and then finish packing the rest of the mold with concrete. Fill the mold with concrete until it is full. 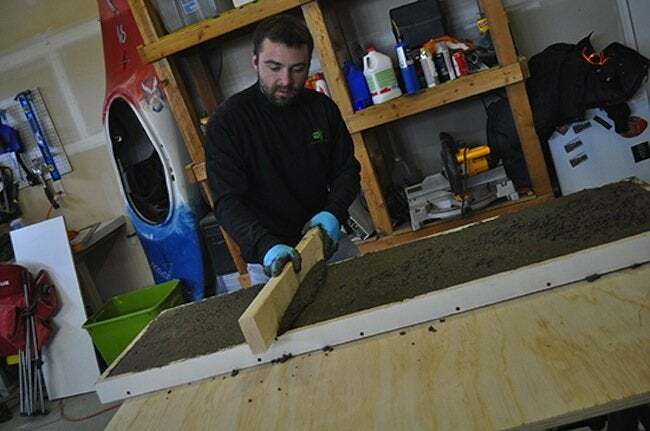 Take an old 2×4 or straight piece of wood and screed off the excess to level out the concrete. Move the 2×4 in a sawing motion. Continue back and forth across the entire mold (multiple times) and fill in any low spots with extra concrete. Check that your work table is still level. You can always shim if needed. A level work table will make sure your concrete table is an even thickness throughout. Once you’ve finished leveling out the concrete lift your work table slightly up and down to vibrate the concrete. 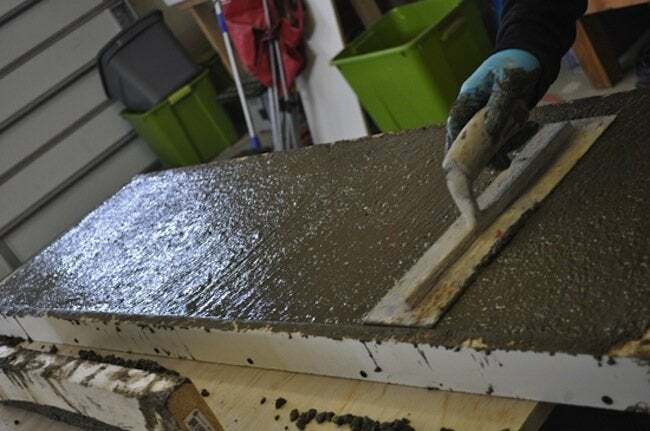 Vibrating the concrete will help minimize the number of air bubbles in your finished piece. This is a very important step. Another way to help vibrate the piece is to hit the bottom side of the table (underneath your piece) with a rubber mallet or hammer. Then use the hammer (or an orbital sander ) to vibrate the air bubbles out from the sides (tap the sides with the hammer). 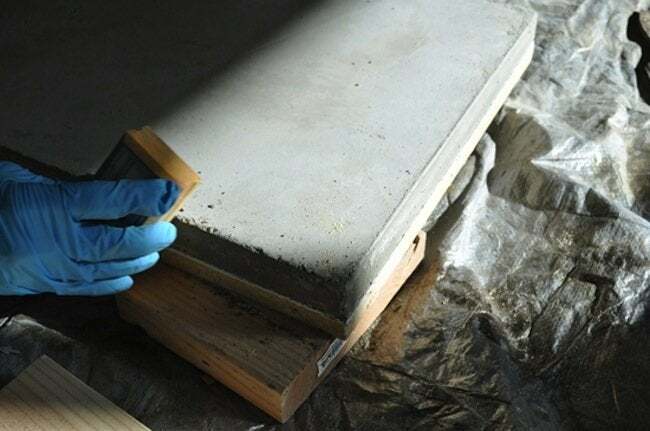 Finally, use a basic concrete trowel to smooth the concrete. 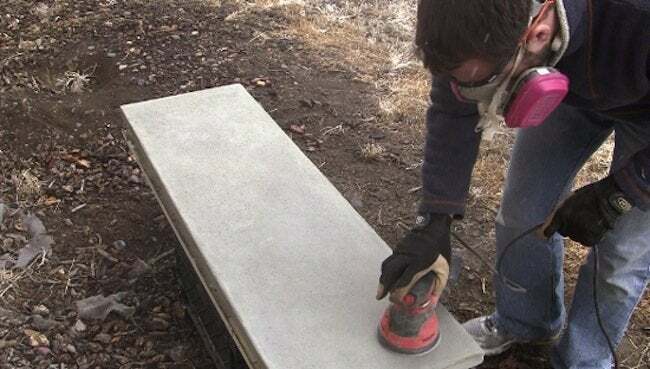 The part you trowel will actually be the bottom of the concrete tabletop. You want the bottom side to be flat so it rests on your table base. Now it’s time to sit back and relax. 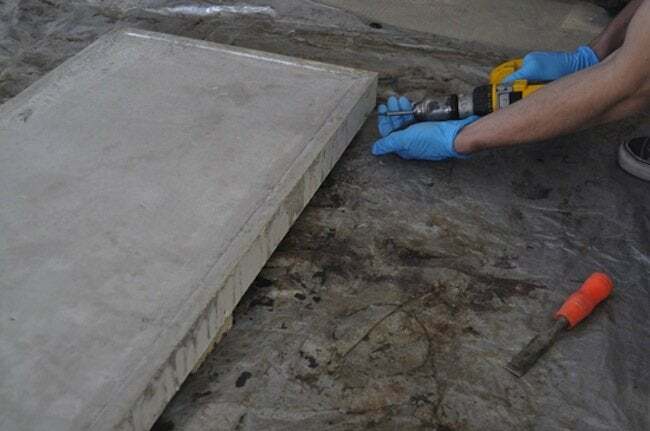 Let the concrete piece cure for a good 3 to 4 days before removing it from the mold. Cheers! Remove all the drywall screws. Next, take a chisel and slowly pry the wood side away from the concrete. Make sure not to let the chisel (or flathead screwdriver ) touch the concrete. Slowly flip the concrete. It helps to have two people. I like to take a few shop rags or foam to put under the concrete so when it is flipped vertically there is something for it to rest softly on. Continue flipping the piece and rest it on a few spare boards. 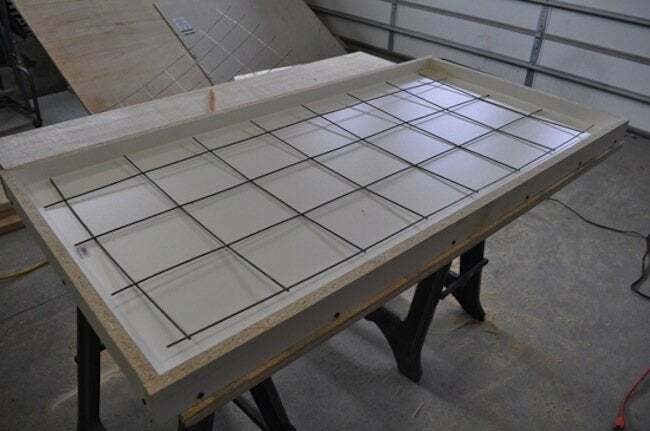 Resting it on boards that are evenly spaced will allow the piece to dry thoroughly. Remove top of the mold. Admire it! Use an orbital sander to smooth the piece. You will expose a few more bug holes but that is okay. Run the sander on the sides and corners as well. The top edges will be pretty rough. You’ll fill in the rough area with portland cement after this process. 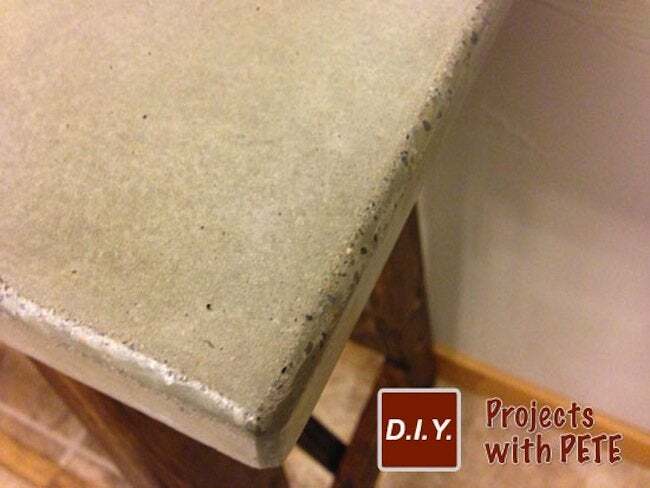 Mix portland cement (not normal concrete mix) with water until it is a toothpaste consistency. You could mix the cement with a concrete fortifier to help it bond as well, but is not necessary. Rub the paste into the bugholes using a circular motion. Fill any other areas with the paste as needed. To fill the rough edges in put some paste in the bridge between your thumb and index finger. Slide along the edge as shown below. After filling the holes use a plastic putty spatula to remove excess paste. Let sit for 1 to 2 hours and then do a final sanding. 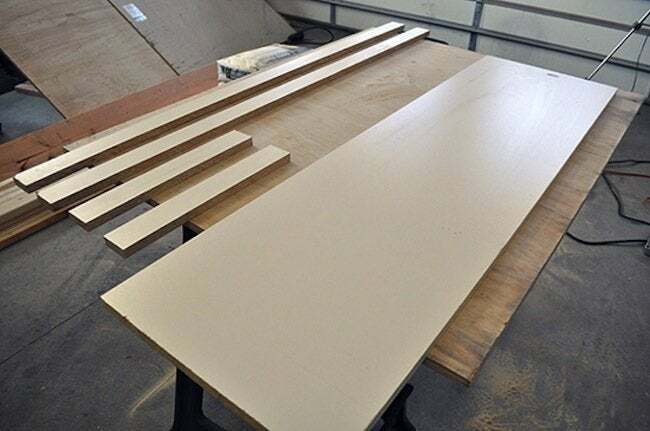 Use 120 and the 220 grit sandpaper to remove extra paste and to give the table top a smooth finish. Round over the edges as well. Use a clean rag and get any remaining dust off the concrete. Next, find a new rag and use it to apply a stone or concrete sealer. These can be found at a local hardware store. Read the instructions to find out the best way to apply the sealer. Once the sealer drys I like to wax the piece. It adds an extra layer of protection and shines the piece up a bit. The paste wax I use is Johnson’s Paste Wax and can be found in the wood stain section at the hardware store. Apply the wax in a circular motion. Then buff it with a clean microfiber rag or terry cloth. It will be smooth and shiny! Set the concrete piece onto your base. If needed, feel free to run a thick bead of 100% silicon caulk around the top of base so the concrete piece doesn’t shift. I’d recommend using caulk on a coffee table because your feet pushing against it will shift the concrete. On a buffet table you could go with or without. Thanks, Pete from D.I.Y Pete! 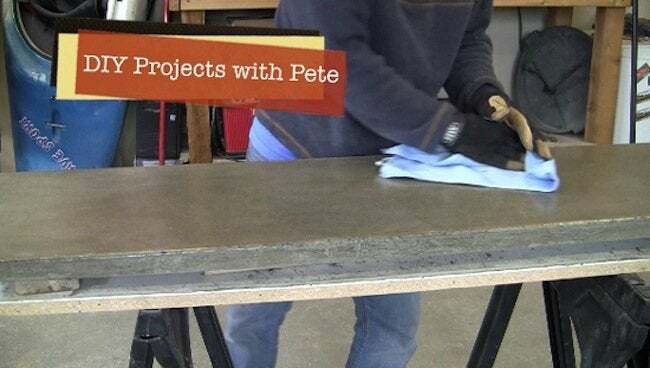 You can check out his video tutorial here and check out his site for even more concrete projects.